Pecan is the common name for a large, North American deciduous hickory tree, Carya illinoinensis, characterized by alternate, pinnately compound leaves, deeply furrowed bark, and an edible, oval nut. The term also is used to refer to this smooth, thin-shelled nut of commercial importance. Pecan is native to south-central North America. The pecan provides an important food resource for many animals, including birds (such as blue jays and crows), squirrels, deer, raccoons, and rats. Reflecting the harmony and interdependence in nature, various animals also help the pecan tree, serving as dispersal agents, spreading the pecan so that it can germinate some distant from the parent tree. Blue jays are the major avian dispersal agent, while the eastern fox squirrel is the major mammalian dispersal agent (Sparks 2005). 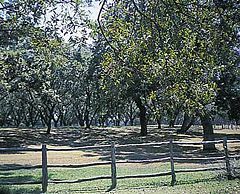 Pecan trees manifest bi-level functionality, meeting their individual needs for sunlight, carbon dioxide from the air, and water and nutrients from the soil, while directly providing food and shelter to animals and the forest understory and also generating large amounts of oxygen through photosynthesis. For humans, pecans also are major food item, whether eaten fresh or used in preparations of other dishes, such as pecan pie or praline candy. The tree also is used for wood. The pecan is a member of the walnut family, Juglandaceae. Members of Juglandaceae have large aromatic leaves, that are usually alternate, but opposite in members of the genera Alfaroa and Oreomunnia. The leaves are pinnately compound, or ternate, and usually 20-100 centimeters long. The trees are wind-pollinated, the flowers usually arranged in catkins, and the fruit is a true botanical nut. Trees in the Carya genus are commonly known as "hickory." The genus includes 17-19 species of deciduous trees with pinnately compound leaves and large nuts. Hickory flowers are small yellow-green catkins produced in spring. They are anemophilous and self-incompatible. The fruit is a globose or oval nut, 2–5 centimeters long and 1.5–3 centimeters diameter, enclosed in a four-valved husk which splits open at maturity. The nut shell is thick and bony in most species, but thin in a few, notably C. illinoinensis; It is divided into two halves that split apart into four sections when the seed germinates. Carya illinoinensis (commonly misspelled illinoensis), known as the pecan, is native to south-central North America, in the United States from southern Iowa, Illinois, and Indiana east to western Kentucky and western Tennessee, south through Oklahoma, Arkansas, to Texas, Mississippi, and Louisiana; and in Mexico from Coahuila south to Jalisco and Veracruz (GRIN 2008; FNA). The pecan is a large deciduous tree, growing to 20–40 meters in height (rarely to 44 meters (FNA); taller trees to 50–55 meters have been claimed but not verified), with a trunk up to 2 meters diameter. The leaves are alternate, 40–70 centimeters long, and pinnate with 9–17 leaflets, each leaflet 1-2 centimeters long and 2–7 centimeters broad. 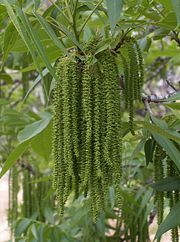 As characteristic of the genus, the flowers are wind-pollinated, and monoecious, with staminate and pistillate catkins on the same tree; the male catkins are pendulous, up to 18 centimeters long; the female catkins are small, with three to six flowers clustered together. The pecan fruit is an oval to oblong nut, 2.6–6 centimeters long and 1.5–3 centimeters broad, dark brown with a rough husk 3–4 millimeters thick, which splits off in four sections at maturity to release the thin-shelled nut (FNA; OBS; Collingwood et al. 1964). The word pecan is from the Algonquin language, meaning "any nut requiring a stone to crack" (GVPC). The pronunciation of pecan is a source of friendly dispute among aficionados. Some people say [pə.ˈkɑn], while others say [ˈpiː.kæn]. Pecans first became known to Europeans in the sixteenth century. The Spanish explorer Cabeza de Vaca saw and wrote first about this plant. The Spaniards brought the pecan into Europe, Asia, and Africa beginning in the sixteenth century. Pecans were one of the most recently domesticated major crops. Although wild pecans were well-known among the colonial Americans as a delicacy, the commercial growing of pecans in the United States did not begin until the 1880s (Ree 2006). Today, the United States produces between 80 percent and 95 percent of the world's pecans, with an annual crop of 150–200 thousand tons (TPGA 2002). The nut harvest for growers is typically around mid-October. Historically, the leading Pecan-producing state in the United States has been Georgia, followed by Texas, New Mexico, and Oklahoma; they are also grown in Arizona and Hawaii. Outside the United States, pecans are grown in Australia, Brazil, China, Israel, Mexico, Peru, and South Africa. They can be grown approximately from USDA hardiness zones 5 to 9, provided summers are also hot and humid. Pecan trees may live and bear edible nuts for more than 300 years. They are mostly self-incompatible, because most cultivars, being clones derived from wild trees, show incomplete dichogamy. Generally, two or more trees of different cultivars must be present to pollenize each other. The nuts of the pecan are edible, with a rich, buttery flavor. They can be eaten fresh or used in cooking, particularly in sweet desserts, but also in some savory dishes. One of the most common desserts with the pecan as a central ingredient is the pecan pie, a traditional southern United States recipe. Pecans are also a major ingredient in praline candy, most often associated with New Orleans. Pecans are a good source of protein and unsaturated fats. A diet rich in nuts can lower the risk of gallstones in women (Tsai et al. 2004). The antioxidants and plant sterols found in pecans are considered to reduce high cholesterol by reducing the "bad" LDL cholesterol levels (LLU 2002). Clinical research published in the Journal of Nutrition (September 2001) found that eating about a handful of pecans each day may help lower cholesterol levels similar to what is often seen with cholesterol-lowering medications (LLU 2001). Research conducted at the University of Georgia has also confirmed that pecans contain plant sterols, which are known for their cholesterol-lowering ability (NPSA 2008). The United States Food and Drug Administration (FDA) has acknowledged this and related research and approved the following qualified health claim: "Scientific evidence suggests, but does not prove, that eating 1.5 ounces per day of most nuts, such as pecans, as part of a diet low in saturated fat and cholesterol, may reduce the risk of heart disease" (Warner 2003). In addition to the pecan nut, the wood is also used in making furniture, in hardwood flooring, as well as flavoring fuel for smoking meats. A large Pecan tree in downtown Abilene, Texas. Flora of North America (FNA). 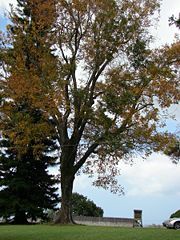 n.d. Carya illinoinensis. FNA Vol. 3. Retrieved April 13, 2008. Germplasm Resources Information Network (GRIN). 2008. Carya illinoinensis (Wangenh.) K. Koch. USDA, ARS, National Genetic Resources Program. Germplasm Resources Information Network. Retrieved April 13, 2008. Green Valley Pecan Company. n.d. History of pecans. Green Valley Pecan Company. Retrieved April 13, 2008. Loma Linda University. 2002. Loma Linda University study of pecans shows that the nuts significantly lower cholesterol. Loma Linda University. Retrieved April 13, 2008. —. 2001. Loma Linda University study of pecans shows they significantly lower cholesterol. Loma Linda University. Retrieved April 13, 2008. National Pecan Shellers Association (NPSA). 2008. Pecans: Cholesterol lowering pecans. National Pecan Shellers Association. Retrieved April 13, 2008. Ree, B. 2006. Pecan kernal: Introduction and history. Texas A&M University. Retrieved April 13, 2008. Texas Pecan Growers Association (TPGA). 2002. FAQs. Texas Pecan Growers Association. Retrieved April 13, 2008. Tsai, C.-J., M. F. Leitzmann, F. B. Hu, W. C. Willett, and E. L. Giovannucci. 2004. Frequent nut consumption and decreased risk of cholecystectomy in women. American Journal of Clinical Nutrition 80(1): 76-81. Warner, J. 2003. FDA ok's nutty heart health claim: Most nuts allowed to tout their role in a heart-healthy diet. WebMD. Retrieved April 13, 2008. USDA Forest Service: Carya illinoensis. This page was last modified on 31 January 2019, at 17:52.